Give your art and photographs a polished look by mounting them with Bainbridge Clay Coated Foam Board. The FOMC8 board measures 8" x 10" and is dual-sided in bright white. The smooth surface is ideal for non-archival mounting of school portraits, art, magazines, and more. This 3/16" board resists dents and cuts clean every time. 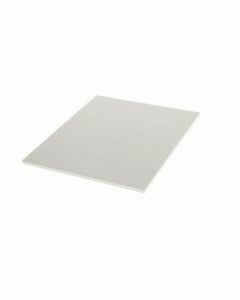 Create a polished look for art and photos with this Bainbridge Clay Coated Foam Board in bright white. Our FOMC811 board measures 8 1/2" x 11" and is ideal for non-archival mounting of photos, artwork, comic books, and presentations. This 3/16" board is clay-coated for a smooth surface and cuts cleaner than any other foam board. Celebrate artwork and photographs with a mounted presentation. Our FOMC9 Bainbridge Clay Coated Foam Board measures 9" x 12" and works great for non-archival mounting of photos, artwork, presentations, craft projects, and more. This 3/16 inch board is dual-sided with bright white surfaces. Cuts clean every time. Create a gallery display of gorgeous photos and art mounted with our Bainbridge Clay Coated Foam Board. Our FOMC1319 foam board measures 13" x 19" and is dual-sided with bright white surfaces. Mount photos, artwork, craft projects, posters, and more. Ideal for non-archival mounting applications. Cuts clean and crisp edges. Create an attractive display of artwork and photos with Bainbridge Clay Coated Foam Board. FOMC14 foam board measures 14" x 18" and is ideal for non-archival mounting of art, class presentations, marketing materials, family photos, and more. The clay coated surface is bright white on both sides and cuts clean every time. Whether you have a single piece you want to showcase or a gallery of photos, our Bainbridge Clay Coated Foam Board will help you create a gorgeous display. The FOMC16 foam board measures 16" x 20" and is 3/16" thick. Mount photos, artwork, class presentations, and more. This board works best for non-archival applications.